Experience The Diva's Wardrobe as a VIP with early entry and a glass of bubbles on arrival! Please purchase your VIP TICKET NOW! Only limited VIP tickets available. Pick up the best designer fashion finds from Brisbane's Premier New + Pre-Loved Designer Fashion Market and be spoilt with exclusive first access during the VIP hour. SHOP: Divas at this event include stylists, fashion editors, boutique owners and fashion agents who will be selling both pre-loved items from their own designer wardrobes and new items from the labels they represent. You are certain to pick up the best designer fashion items at fabulous prices! Your VIP TICKET offers you exclusive access to preview and purchase items from Brisbane’s most-wanted wardrobes, before the doors officially open one hour after your arrival. 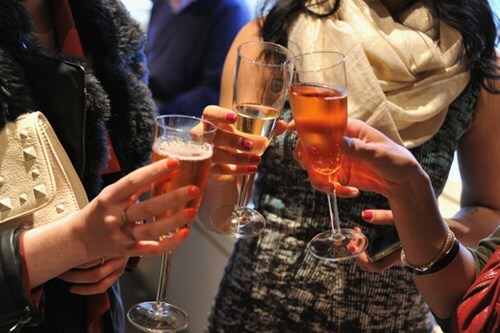 As a VIP ticketholder you will also enjoy a glass of complimentary bubbles on arrival . Entry is $5 per person from 11am - 2pm. SHOPPERS ARRIVING AT 11am AND AFTER DO NOT REQUIRE PRE-PURCHASED TICKETS. PARKING: easy street parking & paid parking lot next to venue. PAYMENT: Some Divas will accept credit cards, PayPal, and some will only be able to accept cash. There is no ATM on site, so please visit a cash machine before you arrive. There is an ATM a short walk from the venue. We do offer passouts so you can leave and come back any time during the event. FACEBOOK: Please like our page and invite your friends HERE.